Picosso first met fellow painter Georges Broque (1882-1963) in 1907. Both were passionate admirers of Paul Cezanne and, over the next few years, they experimented together to develop the art form that come to be called Cubism, Both Picasso ond Braque gradually rejected the conventional single viewpoint that had dominated painting since the Renaissance, producing works that revealed objects as if seen from several viewpoints simultaneously. They also adopted a palette of muted greens, ochres and greys, derived in part from Cezanne, which served to emphasize the formal qualities of their work. In the summer of 1909. Picasso traveled to Horta de Ebro in his native Spain, and here produced a series of landscapes that adopted this newly emerging style. His Houses on the Hill provides a good example of this. 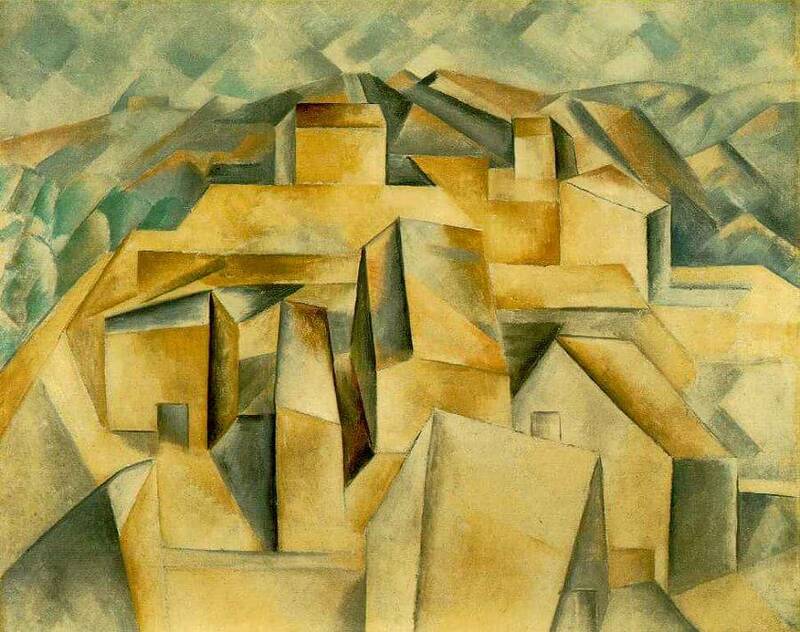 Here Picasso has turned this view of a group of houses perched at the top of a hill into an agglomeration of geometrical forms, with all detailing such as windows, removed. The topography of the scene has also been freely rearranged to emphasize further that this landscape has been produced from many distinct viewpoints.